DSPORT magazine is a premiere publication for automotive enthusiasts who want to learn about the hottest cars, tools, and technologies. As a regular service to its readers, DSPORT tests automotive tools to see if they perform as advertised. For resurfacing brake rotors, BRM’s Flex-Hone® for Rotors tool promises a non-directional finish for lower harmonic vibrations and a quieter ride. 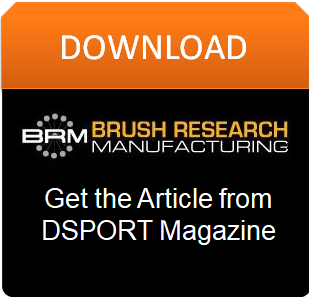 Brush Research Manufacturing (BRM) also claims that its rotor hone removes the accumulated brake pad glaze that contributes to squeaking and squealing in the first place. When DSPORT magazine put the Flex-Hone® for Rotors to the test, writer Jun Chen captured the results of this rotor refurbishment project. Do-it-yourselfers (DIYers), brake technicians, and automotive mechanics will want to know the results. In Glaze is for Donuts: Do-It-Yourself Disc Brake Resurfacing, Chen describes how DSPORT used Flex-Hone® technology to resurface a set of brake rotors from a race car with several days at the track. Although BRM’s Flex-Hone® for Rotors instructions recommend the use of a lathe, the DSPORT team didn’t use one. Instead, the used rotors were simply placed on a workbench. To test BRM’s technology, three different rotor hones were used. First, DSPORT chucked a coarse-grit Flex-Hone® for Rotors in a handheld electric drill. After removing the transfer layer of old brake pad material, a medium-grit rotor hone was used to remove any marks left by the coarser-grit tool. Finally, DSPORT used a fine-grit Flex-Hone® for Rotors to produce the final, basket weave style finish. 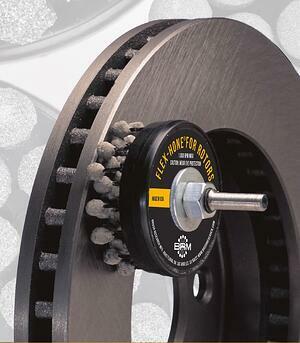 As the magazine article explains, BRM recommends the Flex-Hone® for Rotors for both new and re-turned brake rotors. Applications include fixing improperly bedded rotors and removing surface corrosion and friction material that can contribute to brake noise and vibration. Flex-Hone® for Rotors tools can also remove sharp edges from slots and cross-drilled holes on the face of the brake rotor. As DSPORT noted during testing, the Flex-Hone® for Rotors has a self-leveling design that delivers equalized pressure to the entire surface area. By applying light, uniform pressure without excessive dwell time, even a new Flex-Hone® for Rotors user can get great results. To learn more about the DSPORT team’s project and what BRM’s Made in America rotor hone can do, download the Glaze is for Donuts article.